The 87th Academy Awards ceremony, presented by the Academy of Motion Picture Arts and Sciences, honored the best films of 2014 and took place yesterday February 22, 2015, at the Dolby Theatre in Hollywood, Los Angeles. Celebrities including Jamie Chung, Behati Prinsloo, Scarlett Johansson, Zoe Saldana, Reese Witherspoon and more rocked the redcarpet in their best gowns. Dakota Johnson was 50 shades of red in Saint Laurent gown at the 2015 Oscars red carpet. One of our fave has to be Jennifer Lopez in this beautiful gold Elie Saab gown. Rosamund Pike looked so beautiful in this flowery red Givenchy gown and open toe shoes. Scarlett Johansson wore an emerald-green gown from Versace with a detailed neck that made her look outstanding. 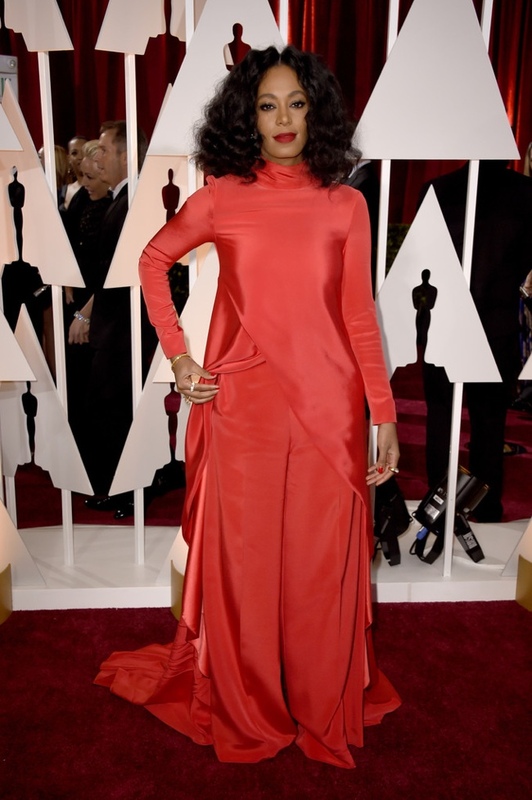 Solange Knowles stunned in one of her famous curly hair-dos and wore a Christian Siriano red piece. Zoe Saldana looked amazing in her gorgeous Versace gown, the beautiful actress gave birth to twins 3 months ago and rocked the red carpet Oscars 2015 like this. Yas Zoe!